The WoodPro WS-TS-2000 wood stove provides high-efficiency heating to more sizeable spaces. The 56,000 cubic centimetre, EPA-certified firebox holds a stack of 53 centimetre logs and can burn continuously and efficiently for up to 10 hours, while the included 2.8 cubic meter blower maximizes heat distribution in your home. The single cast iron door with large window provides easy loading and a beautiful view of the fire. Pleasant Hearth non-catalytic wood burning stoves will warm your heart and your home with highly efficient and effective indoor zone heating. This stove has been EPA certified with emissions at 3.9 g/hour Perfect for single-family use with little assembly required. All Pleasant Hearth wood burning stoves feature a brick lined firebox, chrome handles, air wash system that automatically maintains the cleanliness of the glass window, front-loading solid cast iron door with large ceramic glass viewing area and a 5-year limited warranty. Stoves operate best when fuelled with seasoned cord firewood. Heating coverage area is up to 1,200 sq. ft. Pleasant Hearth pellet burning stoves provide will warm your heart and your home with highly efficient and effective indoor zone heating. This stove has been EPA certified with a 85% efficiency rating. Perfect for single-family or mobile home use with little assembly required. All Pleasant Hearth pellet burning stoves feature chrome handles, air wash system for cleaner air, solid cast iron door with large ceramic glass viewing area, and a 5 year limited warranty. Stoves operate best when fuelled with premium pellet fuel. Heating coverage area is up to 1,750 sq ft. The 2016EB is a free standing, EPA Certified, wood heater that provides both an economical and attractive means of reducing heating costs by offering excellent heating by both a conventional and radiant means. It's constructed in heavy-gauge plate steel for durability and years of high performance. Tested and certified to U.L. 1482 by Warnock Hersey International for greater peace of mind and safety assurance. A quiet, efficient, 100 cu. ft. per minute blower, is included with the purchase of this stove. This handsome pedestal unit blends nicely with a variety of room settings and brings a heartwarming glow to any decor. Decorate your hearth and add style with this solid tile hearth pad. It is designed to met all local safety codes for ember protection for your wood or pellet stove. It arrives completely assembled making installation a breeze. This is a type 1 hearth pad and does not provide thermal protection for flammable floors. Medium Wood Stove The WoodPro WS-TS-2000 wood stove provides high-efficiency heating to more sizeable spaces. The 56,000 cubic centimetre, EPA-certified firebox holds a stack of 53 centimetre logs and can burn continuously and efficiently for up to 10 hours, while the included 2.8 cubic meter blower maximizes heat distribution in your home. The single cast iron door with large window provides easy loading and a beautiful view of the fire. Medium Wood Stove is rated 5.0 out of 5 by 1. Rated 5 out of 5 by jmterrace from Great price, solid first impression. I've only been running the stove for 2 days now and so far I'm very impressed. I can only fit about a log and a half in the fire box if they're split so I didn't expect the stove to still be burning in the morning but it was! It was only about -2 so I had it dampered all the way down but I am still very impressed. At 200-500.00 less than comparable stoves its a no brainer. what is the maximum stick length? what is the height of the fire box? 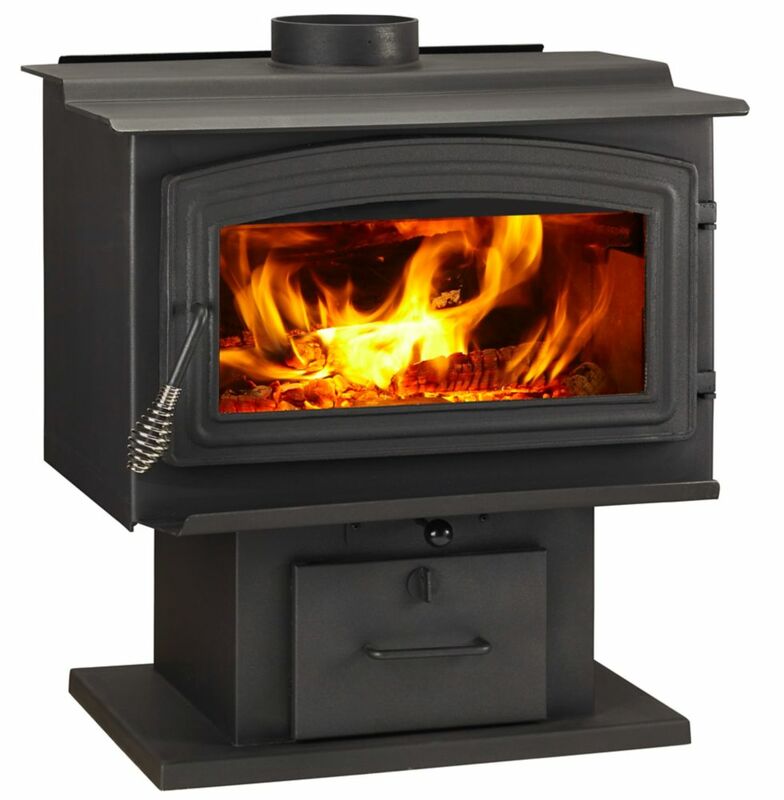 This wood stove can handle up to 21 inch firewood and the firebox is 10 inches high.